Happy Monday, everyone!! I hope you all had a great weekend! Here’s a look I wore last week while we toured a few spaces for a fun event for the fall collection of my clothing line. Stay tuned for more details!!! And if you haven’t see the newest arrivals that hit the shop last week, click here. Cute outfit! Those shoes are on my wish list. Such a versatile piece for any outfit with a neutral colour. That color looks gorgeous on you Rach! Love the hemline on this dress…so fun! there are not a lot of people who can wear green – but you are totally rocking it! super cute pictures! Gorgeous look, Rach. I’m super excited to see your maternity pics. The two you posted on Insta are so dreamy that I can’t wait to see more!!! I love the color of this dress so pretty! That dress looks so pretty on you! I love the color! I have the same Anthro dress in pink! 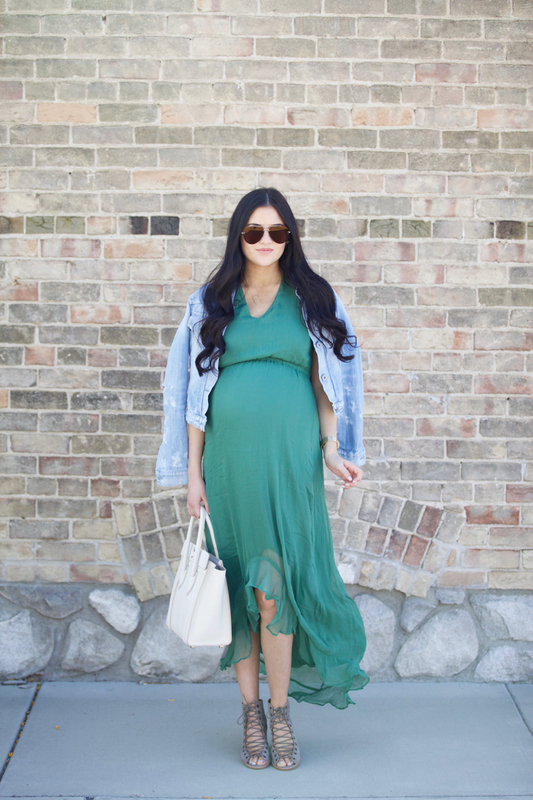 I love emerald for fall so maybe I need both?! I love this dress! 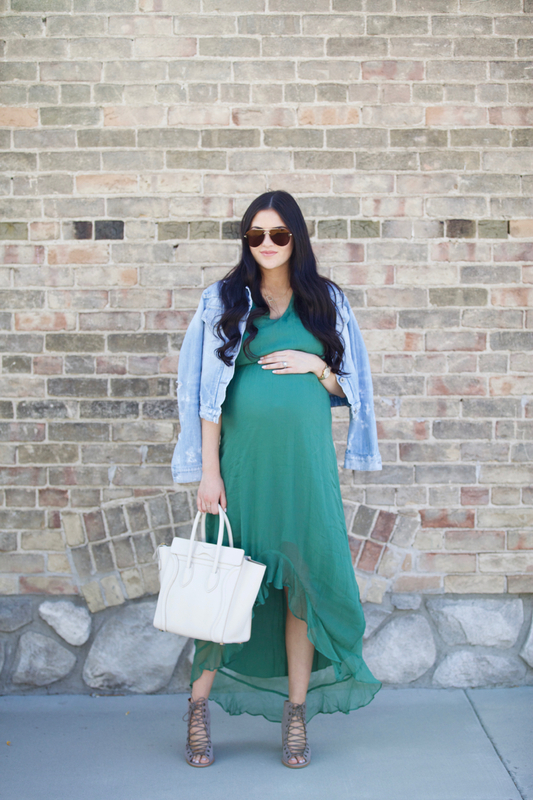 I’m always amazed at how even this far along in your pregnancy you can find so many great non-maternity looks! You look amazing and I love that color on you! Pretty dress! I love that emerald color for fall. Love this pretty emerald color! Such a cute summery look! love the shoes with that dress! you look so great! Loving that dress and those bold sunglasses! Cute outfit! Love the bag and sunglasses! Also loving the daisy pieces from your new arrivals! You are stunning! Can’t wait to see baby! Gorgeous color dress!! And I’m impressed you’re still in heels!! Way to go! Looking gorgeous! Love the Celine bag! Seriously the cutest pregnant lady of all time! Love this green dress on you! Absolutely love this look and that necklace is to DIE for! I am absolutely in love with the shoes, and the emerald color is so gorgeous! What a gorgeous color! 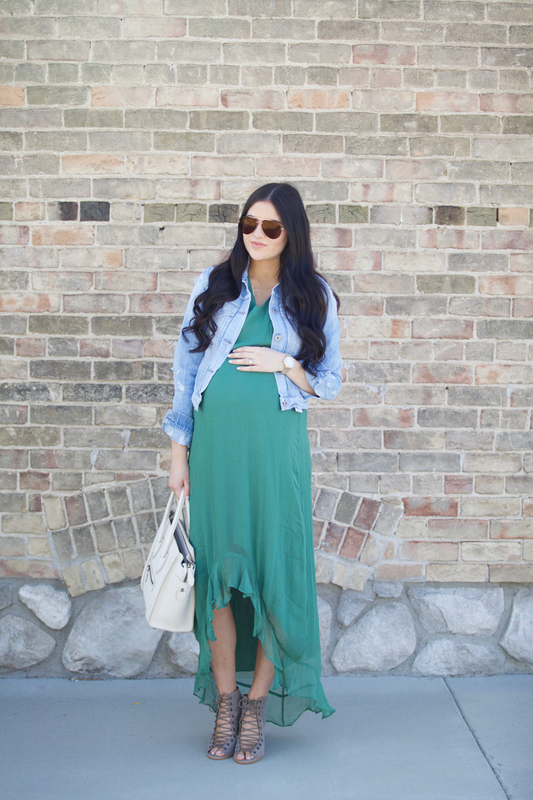 Loving that ruffle, high-low hem…so pretty! Loving those booties! They are next on my list! Hi can I ask what your sunglasses are? Thanks! Really love that denim jacket! You look amazing in that pretty dress! Gorgeous photos! That shade of emerald is stunning on you, thank you for sharing! Thank you Kristen!! I love these heels! Hi Rach! Looking gorgeous!! Just curious.. is it safe/recommended to wear heels during pregnancy? I love the color of this dress! You look amazing! ideal manner of writing? I’ve a presentation next week, and I’m on the search for such information. Love this color on you so pretty! Stunning, Rachel! 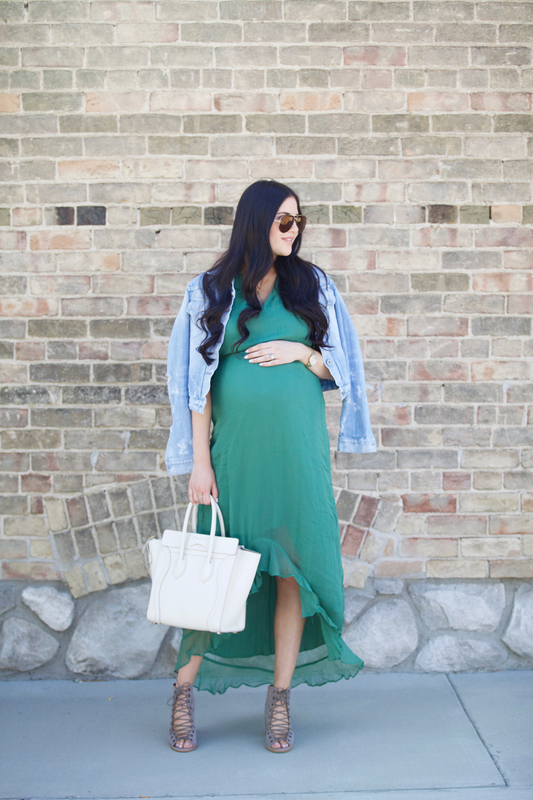 LOVE LOVE LOVE this emerald dress on you! Lovely dress! Your shades are so cool. Beautiful dress! You look stunning. Gorgeous dress! That color looks amazing on you!! Your design is beautiful. when can i use your design?